Browse: Home / 2018 / December / 29 / Green Party Leader Tells National Audience: “Average German Emits 9 BILLION Tonnes Of CO2 Annually! 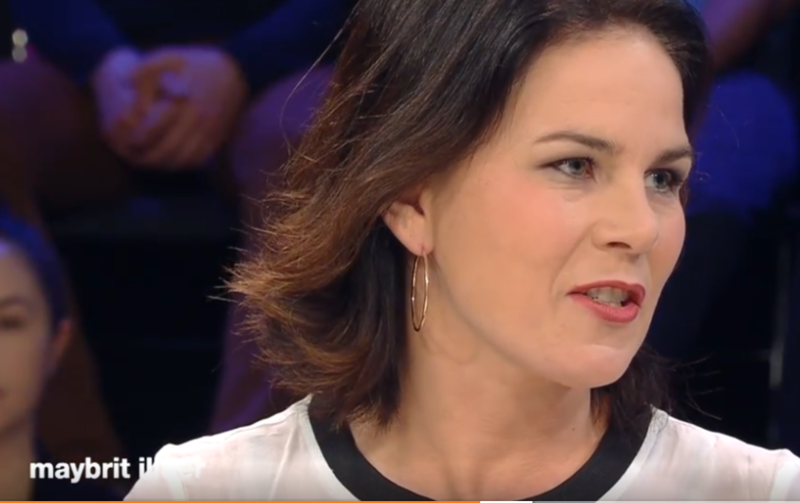 German Green Party leader Annalena Baerbock appeared on German talk show Maybritt Illner (30:59 mark) on December 13, 2018, where she confidently told before a national audience how the average German citizen emitted “9 BILLION tonnes of CO2 annually”. German Green Party leader Annalena Baerbock claims average German citizen emits 9 billion tonnes of CO2 annually. Screenshot: Maybrit Illner, ZDF German public television. That figure of course sounded quite scary. But there’s only one problem: Baerbock was just a little off, by a factor of 1 billion! The average German citizen of course emits only 9 tonnes per year. Just as scary is that no one from the “expert round” was well enough informed to call her out on her glaring exaggeration. Now if there had been someone included in the round who actually knew what he/she was talking about, like a real skeptic, she would have been promptly corrected. So now almost every person in Germany believes he/she emits 9 billion tonnes of CO2 annually, and that the citizens of Fergus Falls, Minnesota watch American Sniper everyday. German media has yet to reach a new low point. In the talk show, Baerbock tries to act like an expert on energy and as if she holds engineering qualifications to tell us what Germany needs in terms of energy supply and what works. Her qualifications: She studied political science and public law at the University of Hamburg and got a Masters degree in public international law. That’s right, a union coal miner was the best German public television could do to represent the skeptic side. Half of the round are made up of strident climate activists, one third (Altmaier and Lindner) are non-fanatic green energy supporters, and only one, the union man, is a supporter of coal. Real, articulate skeptics are never invited to these rounds. So it’s little surprise that Germans are so ill-informed and believe such things as 2 meters of sea level rise by 2100, each German person emits billions of tonnes into the atmosphere annually, and rural Americans watch American Sniper every day. No wonder Germany’s Energiewende is such a mess, and risks getting a lot messier. One silly lot of boneheads has a free hand at running the country. What is the carbon footprint of the German Green Party leader? One can be sure it is well above “average”. Probably 30 billion tonnes, using her scale. In fact your figure is probably lower than the mean for all those on the list you compiled above. What is 9 billion tons times 90 million German citizens? How much does the ocean weigh? Well Germans in general talk too much, IMO, it kills the climate. One can’t talk and drink at the same time, so one has to get one’s priorities in order. I am convinced that Germany is determined to commit suicide. I think they’ve already jumped… not sure if there’s anything at the bottom to cushion the landing. Details are unimportant. What is important is reducing the West to third world status, thus promoting social justice. A degree in “political science” makes you an expert in anything. Especially in cherry picking supporting facts. Long live the ZDF, the unbiased objective source. Wrong quote! She said (at 31:00) that “Germany has per capita emissions of 9 gigatons, per inhabitant”, pronouncing the number and the per inhabitant. So the wrong “Giga” did somehow not get through. If she had pronounced “billion tons”, everybody would have wondered whether it should be short scale billions (10^9) or long scale billions (10^12) and come to the conclusion that it’s 9.000 kg per person, each year. Still too much for our atmosphere, we have to come down to zero! Annalena Baerbock clearly memorized the wrong number. Applying the prefix “Giga-” to a per capita energy consumption figure is just strong evidence that the Green Political Leader is numerically illiterate in matters of energy. It was unfortunate that none of those present who knew this was a faux-pas felt it necessary to correct her mis-statement. But her argument was essentially that Germany’s per capita emissions was too high (10x that of Bangladesh, for example), though nobody apparently considered it worthwhile to educate her on the standard of living in Bangladesh (and how the Chinese had managed to improve the standard of living of the average citizen specifically by increasing the energy usage (consisting 9/10 of fossil fuel consumption)! The better quote came from Stefan Rahmstorf, who insisted it would be useless to make promises which one (as a nation) couldn’t keep, whereupon he reminded us of a host of unkept promises over the past several decades. Then he doubled-down on the UN claims (which he of course supports) which would require drastic annual CO2 reductions over the coming 12 y, followed by a ‘Zero-Carbon Society’ come 2050. You couldn’t make this stuff up. Several of the participants made a point of laughing at Donald Trump for pulling out of the Paris Commitments (with support from Russia and the Saudis, noting the NYT’s Paul Krugman’s new “Axis of Evil” proclamation). Yet Trump seems to be at least aware that the UN’s goals are indeed illusions. Rex Murphy of the CA National Post has just written about media bias. As usual, his prose is fantastic. Annalena likely got her number from Al Gore. “They” tell us how much CO2 in billions (!) of tons or GIGAtons (!) we emit. Oh, woe is me! What they don’t tell us is the puny RELATIVE amount of CO2 emitted by human activity. In 2007, I asked that question and was referred to a specific table in the IPCC 2004 AR4 report. Doing some quick math, the estimated amount was a ridiculously trivial 2.9%! 2.9%! Later, the median value seemed to center around an also trivial 4%! That means that 96% to 97% of emitted CO2 is from natural sources (the biosphere, ocean, volcanos, etc.) over which we have no control. These are the figures that should be thrown in their face. If anyone can update these values, please let me know. Germany should therefore provide all the payments to the poor countries under the Paris Agreement as they are the root cause of the “””PROBLEM”””. Yes and in OZ the Sydney Morning Herald environment reporter Peter Hannam has a degree in Social Work. On top of that there is NEVER any reporting from him of “skeptical” science. Back when Obama began campaigning, he said 10,000 people were killed when a tornado allegedly destroyed a whole town. He was only off by 3 orders of magnitude on the deaths. Leftist politicians and activists embellish everything, and the Leftist media runs interference for them. And that would make them no different than the MSM in the US, or any other Western nation. It is enough to make one wonder sometimes if unification was such a good thing. I know it was a part of their national soul but I still sometimes wonder if the Germany I knew in the 80s would still exit if there had been no reunification. I’ll have nothing said against her! She’s LOVELY! You can’t make up stuff like the hyperbolic stuff the greenest people on earth can make up. Munchausen syndrome by proxy has afflicted their empty skulls. Problem is, Germany is now energy sick because it has feckless leaders who had to find all of the cures and have them prescribed to cure its energy sickness, which never existed at all. The final result is there are now 30,000 wind turbines that need constant maintenance and are a millstone around the necks of Germans. Should cause some cognitive dissonance, and it is obvious that it has in the Green Party kakistocracy. Why can’t the Greens understand that fossil fuels are going to be used and consumed by people so they can live and survive using the most modern conveniences possible? Not that difficult to grasp the concept, doesn’t need much research and analysis. Electricity is by far and away the most desired of all energies. If I want to heat my house in winter, all I have to do is use a thermostat to adjust the indoor temperature so it is warmer than the cool and cold outside temps. Electricity rocks. Oil is fine for transport and the generation of electricity, a power plant on a ship produces electricity and the power is derived to drive movement of the hull. If you have a power plant to drive the twin screw propellers, might as well generate electricity, makes life just a little bit better, just a better world. Those who want to control others are probably misanthropic anthropes anyhow, nobody really cares, except the damage done is colossal and catastrophic. Culprits need to be apprehended, arraigned, tried for being just plain stupid, trial by jury, somebody has to render a verdict on how much stupidity they have, then sentenced, the death penalty wouldn’t be a severe enough punishment. Well, not that, but you can kill them with kindness. It’ll help make it all better. You have to be kinder and gentler, killing them with kindness will work the best, but you can’t let them off the hook. Annalena’s beauty has plenty of sizzle. You don’t sell the steak, you sell the sizzle. The World is just about to implode. The AGW people have found a new argument !!! Annalena Baerbock’s claim of the average German citizen emitted “9 BILLION tonnes of CO2 annually” is truly heartwarming to hear. Thank-you German citizen average for all your efforts. Oh, I see. She said it, but didn’t mean it – so she didn’t say it. Too funny! So Ödzemir has also just filled his head with meaningless numbers which he throws out at will. Too bad the quality of TV interviewers is so low that he didn’t just laugh out loud. So A. Baerbock can display gross numerical illiteracy and get a free pass, whereas you find that comparable to Trump confusing Brussels with Belgium. And you would trust these people with your taxes? And you actually believe the Mercator Research Institute widget that shows humans can only afford to produce 378 GT of CO2 between now and forever, otherwise ‘ze Tipping Point’ of 1.5 ℃ would be reached, thereby dooming future terrestrial climate to an infernal calamity? Really? Do you belong to a cult? let’s put it this way: politicians should be perfect, but luckily they are still humans. So a slip of the tongue does not bother me too much. Thanks for mentioning the 378 GT of CO2. Such a precise number cannot be true, as the whole system is far too complex. I’d have a guess that with another 800 GT CO2 more in the atmosphere we’ll be in real trouble, some say we are alredy at “minus” GT of CO2. The next generation will know. Your feared delta Temp. (since pre-Industrial times) is around 1.75 deg. C (meaning we have about 18 y at the current CZO2 emission rate before it’s too late). Right (or did I miss something)? Un felice anno 2019 anche a te! 800 GT means 18 years without breaking or 30 years with a moderate pace of rebuilding our energy systems. I doubt that 1,75 °C of rising temperatures can be measured exactly. In some places it will be 4 °C, in other maybe 1 °C and then there will be a discussion how to calculate the average. For 770 thousand years our planet had no CO2 concentration above 300 ppm, see https://www.co2levels.org So a 33 percent increase by 33% in only a bit more than 100 years with high probability will have an effect.